View of the Bowers from the Metal Bridge with the tower of the Kenny Mill in the background. Swans frequently seen on the canal. The Military Bridge with the Cavalry Barracks in the background. 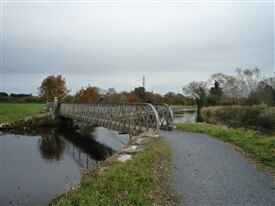 The second metal bridge near the weir. 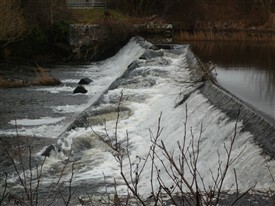 The fish pass or steps at the weir. 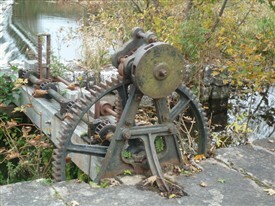 Remains of old machinery for lifting the lock or gates at the weir. The Bower’s Walk stretches for approximately 3 kilometres along the River Robe starting at the bridge on Bridge Street towards Creagh Bridge along the old towpath of the canal. One can return the same way or join the Creagh Road, turning right at the gate at the top of shallow steps which will bring you back into town (6kms). Please close that gate! It is a beautiful walkway, passing by stone walls, trees and then under a metal bridge, followed by a two- bay cut stone bridge. Another metal bridge is crossed at the weir following along by the banks of the canal towards the Springvale Bridge. 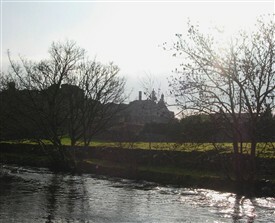 One can see the town skyline, the back of the Court House, the old Rectory, the new Credit Union building, the ruins of Cranmore House with its waterfall from the Bulkaun river, the Infantry Barrack site and the Cavalry Barracks ruin along the route together, with ancient habitation sites and also some of Ballinrobe’s various steeples and towers. The mountains in the distance are the Partry Mountains, Mount Gable and some of the Connemara Mountains. 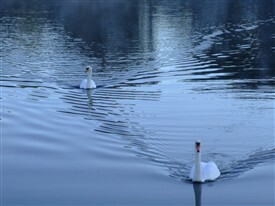 Swans and wildlife are plentiful, together with a variety of flora and fauna when in season. The Riverside Walk is a tranquil and peaceful amenity away from traffic and noise. The sound of the Bulkaun waterfall at Cranmore, and at the weir is therapeutic, contributing to a feeling of calmness and relaxation in this busy world. A Bower is described as part of a pleasure garden originally designed as a safe for areas for the ladies of the manor house to walk outdoors. These walkways/paths were often enclosed by overhanging trees or sometimes by vine covered trellises. Seating was sometimes provided. The original idea was created by Lancelot Brown (1716-1783) who was more commonly known as Capability Brown, and was an English landscape architect. One can still see many of his superb gardens at many of the great houses, where his style moved away from formal gardens and toward more pastoral settings of lakes, groupings of trees, serpentine lakes formed by invisibly damming and a lack of boundaries. These new ideas swept away almost all the remnants of previous formally patterned styles, so beloved on the Tudor period and of French and Italian style. 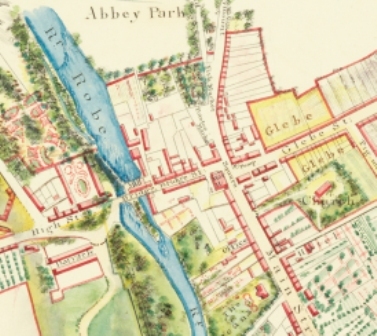 What could be considered the original Bower Riverside Walk was probably created by the Kenny family with their taking a lease on Robe Villa c. 1735  . This area was probably enhanced by the Cuff Family when James Cuff (the local landlord) renovated the New Castle as a Manor House c. 1752. This property was later sold to the war office to serve as a Cavalry Barracks. James Cuff was born at Elm Hall near Belcarra, son of Michael Cuff who had inherited the property from Thomas Cuff, he being the first Cuff to live at Creagh c.1686. This family valued academia and were very progressive (see separate article on Cuffs and Creagh). James was well educated having entered Trinity College Dublin in 1724 aged 18 years and was later an MP for Mayo. The Kenny Family, acting agents and large landowners in the area and were closely connected with the Cuff Family. Further redevelopment occurred when Cranmore House was built c 1838 by Alexander Glendenning Lambert, agent to Col. C. N. Knox, close to the Cavalry Barracks. It consisted of a walk along the smooth banks of the River Robe’s opposite the current walk on the site of the old tow-path. 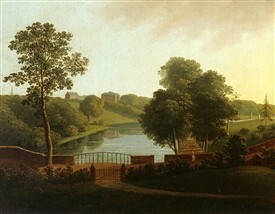 When Col. Knox took over Cranmore House c 1850 he extended the walk further and came to an agreement with the owners of houses and gardens on Bowgate Street to build a high wall extending from Bower’s Lane to the back of Vet O’Neill’s & Kelly approximately 10 meters from the river thus creating The Lady’s Walk. He allowed the owners of these houses access to the river through gates from their property to the walkway. This walk, on the other side of the River to the one we have today, continued along the river, under the Military Bridge and seems to end close to the pond of the Military Barracks. Traces of the banking walls can still be seen across the river from the present Bower’s Riverside Walk. The short Bower Riverside Walk (3kms) was extended when the Cuff Family moved out from the Manor House (later the cavalry barracks) to Creagh, close to the mouth of the Robe River, where they created large gardens and extensive walking paths. Some of these bounded the River Robe and traces of the stone banking system can still be seen at the Creagh side of the Robe. Later, with the Cuff/Knox families using Cranmore House as a dower-house, a walkway was created from Creagh gates to Cranmore along the riverside near Springvale Bridge. At the beginning of the Bower’s Walk the first item of interest at the beginning of the Bower’s Walk is the monument in memory of Felix Waitkus’s solo flight across the Atlantic. It is a replica plane’s tailfin. In 1935, bad weather conditions forced Lithuanian pilot Felix Waitkus to make an emergency landing just outside Ballinrobe in his plane Lituanica II which was a with a single engine, single seat airplane. He had earlier taken off from New York, and was the only solo pilot to cross the Atlantic that year, and the sixth ever in aviation history. Waitkus fought terrible weather conditions and was helped considerably by hourly broadcasts from an Irish radio station. In recent years, many Lithuanian people have settled in Ballinrobe and this has brought renewed interest in Waitkus’ story. For the past three years Ballinrobe has hosted Ireland’s Lithuanian Community for an annual festival and this has provided the impetus for a formal twinning arrangement which took place in 2010. Remains of the outer battered stone wall of the Infantry Barracks, now the site of an enormous telecom communications tower is visible on the right at the beginning of the walk with its narrow slit windows inserted high up on its defensive wall. This elevated site commands a view of a vast area on the hinterland around Ballinrobe. 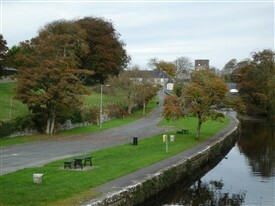 Around 1849 a decision to link Ballinrobe to Lough Corrib and onward to Galway and the sea, through a man-made canal, was planned. This development would allow trading between Galway to the south and onward by road to Castlebar. The scheme was abandoned in 1856 for use as a port due to the lack of funding, as the railways were fast replacing the waterways as a means of transport. A gentle grassed in slope leads to an area which was once the proposed landing area for sailing boats and later a steam boat. 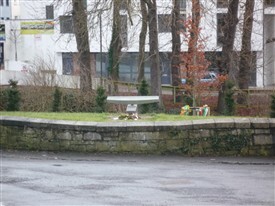 In the past this area was called Canal Pier where bollards are still in situ for vessels berthing. The cut stone steps you will see ahead lead up to the 1st metal bridge which connects back up to Main Street through the steep Bower’s Lane. The new metal bridge replaced the old one in 2010. If one walks under the Metal Bridge the next attractive sight on your left is the Bulkaun Waterfall. 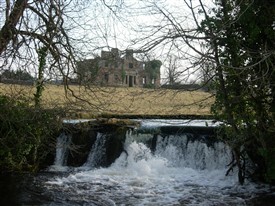 In the background are the ruins of Cranmore House originally owned by the Knox family and built by their banking agent. Control of the Robe was an important factor in the commercial and military life of the town. According to the Ballinrobe Chronicle in 1897 a proposal to deepen the locks to facilitate a steam launch to serve Tourmakeady was proposed by Fr. James Corbett PP but rejected by Col Knox. 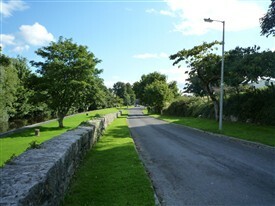 The cut stone steps close to this area leads up to the metal bridge and on towards town through Bower’s Lane. 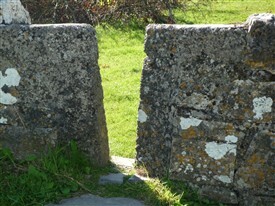 A cut stone stile leads to the Green. As one progresses along the walk the ruins of Cranmore House on the left across the Robe set in its own parkland. The waterfall is formed where the Bulkaun River joins the Robe. 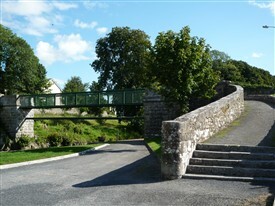 The Military Bridge joins the Green, which was used as an exercise area for the cavalry horses, with the ruins of the Cavalry Barracks formally the manor house of the Cuff family and prior to that, a MacWilliam castle. One can take the protruding stone steps that link to join the higher area of the Green at this point (see separate -“The Green” walk). Extensive alterations were made to the Robe close to this bridge. 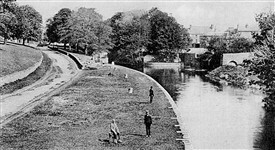 There were islands in the middle of the River but these were removed to allow for building the retaining banks of the canal. 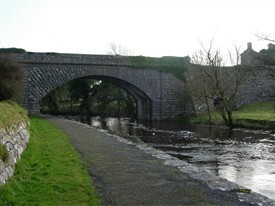 Beside the single cut stone arch of this bridge one can see the small arch on the barracks side to allow for a continuation of the walkway on that side of the Robe. Traces of the banks can still be seen along with a bank on which trees are now growing. When one passes under the cut stone Military Bridge and further along the walk one finds a gate on the right between the bridge and the weir, which leads past the water treatment plant and on to the Creagh Road. Adjoining this area one see remnants of an early ring fort – Rathkelly, after which the townland is named. Rathkelly is a typical ring fort and would have been used as a dwelling-place. This banked and circular enclosure would have contained one or more simple houses made of upright wooden posts interlaced with a wattle-and-daub lattice construction. At night the domestic animals would have been herded into the enclosure through a gap in the bank, which would have been closed by means of a simple gate, or other barrier giving protection against predators such as wolves. Sometimes a souterrain is found within these enclosures which been had been used to store food or used as a hiding places during times of danger. Often the entrance was hidden for safety. Most ring-forts were simply, and varied from 20m-63m in diameter and sometimes had two or even three concentric rings. It has been established that most were from early Christian times, though some were from the earlier Iron Age while some continued to be occupied as late the 17th century. Large enclosures could have accommodated family groups, which formed the basic unit of early Irish society. 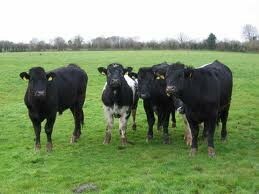 Close to this early Irish habitation site are some Fulacht Fiadh. These cooking places involved use of a small stone pit or, in some cases, a wooden trough. 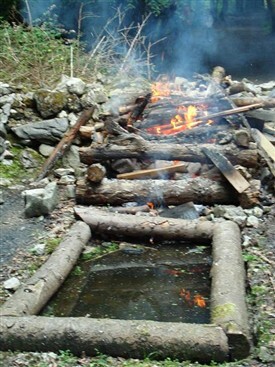 The pit or trough was filled with water and this was brought to the boil by adding heated stones. Joints of meat, sometimes wrapped in straw to keep the meat in one piece, were then placed in the pit and cooked. As the stones were added often they cracked into smaller pieces. After the cooking was finished, these fragments would be removed from the cooking pit and thrown to one side, building to a horse shoe mound around three sides of the pit. This horseshoe-shaped mound is a characteristic feature of Fulacht Fiadh and is often the only way of locating one. Passing over the second metal bridge, one see a fish pass. This was originally called the Salmon Weir as it was expected that salmon would find their way to Lough Mask when the link with Lough Corrib was finished. 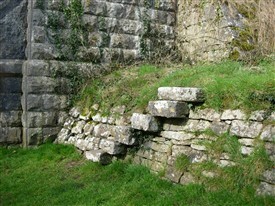 This weir is made of a series of rising pools to enable fist to ascend in steps from the lower level of the Robe. The pools needed to be deep enough to keep turbulence to a minimum and the sides high enough to prevent fish from jumping out with the velocity of the water flowing through the steps. Unfortunately with the failure of linking to the Corrib the expected fish never arrived. On both sides as the weir one can see the remains of a type of lock gates or paddles with their winding mechanism which would have allowed gates to be lifted (opened) or lowered (closed). These gates would have been shut to increase the level of the Robe and keep a sufficient flow of water over the fish pass at all times. At this point the Robe is divided and partly diverted into a canal to avoid rapids in the river. The walk continues along the canal bank until one reaches a set of gradual shallow cut stone steps leading up to a pedestrian gate. At this point the Bower’s Walk ends but, on turning right, one can continue on into town on the Creagh Road. When one joins the path one can see the original entrance to the Creagh estate with one of the original gate lodges on the left just the Bridge. Be careful this is a narrow and dangerous bridge for pedestrians! 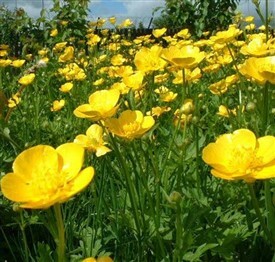 This page was added by Averil Staunton on 06/02/2011.